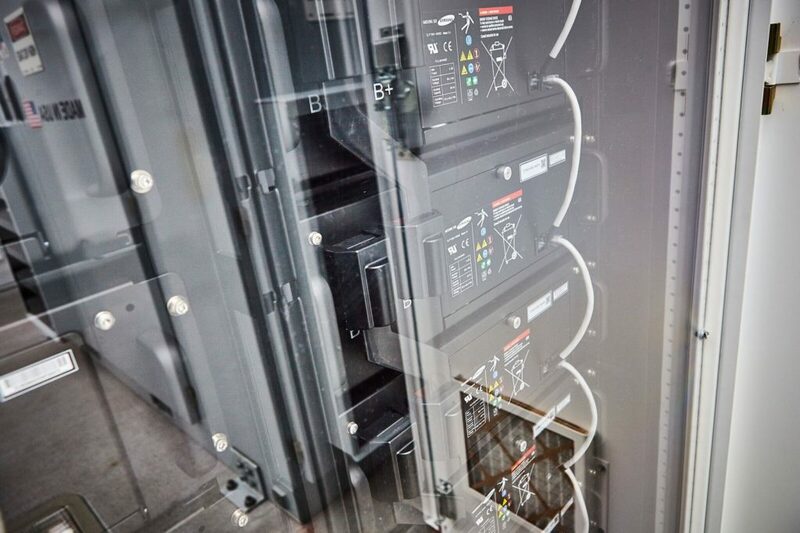 The NZP ETI features an advanced battery energy storage system comprised of Samsung SDI lithium-ion batteries. This system, integrated through the microgrid, stores excess energy produced by the onsite PV solar array that can be used later when it’s needed. It will automatically save energy off-peak when the cost is lower and power on the grid is plentiful and it will use energy during peak times when it’s in high demand and more expensive. Using alerts provided to the building energy management system by the local utility, the NZP ETI can participate in Auto Demand Response programs by injecting power into the electrical grid when demand is high. The NZP ETI’s ability to provide power to the grid and smooth out PV solar production onsite helps contribute to a more reliable electrical grid. The NZP ETI also has islanding capabilities, with the ability to operate for approximately 72 hours disconnected from the grid using energy stored on the center’s battery storage system. This capability demonstrates how buildings can operate during natural disasters or grid disruptions, contributing to improved emergency response solutions.